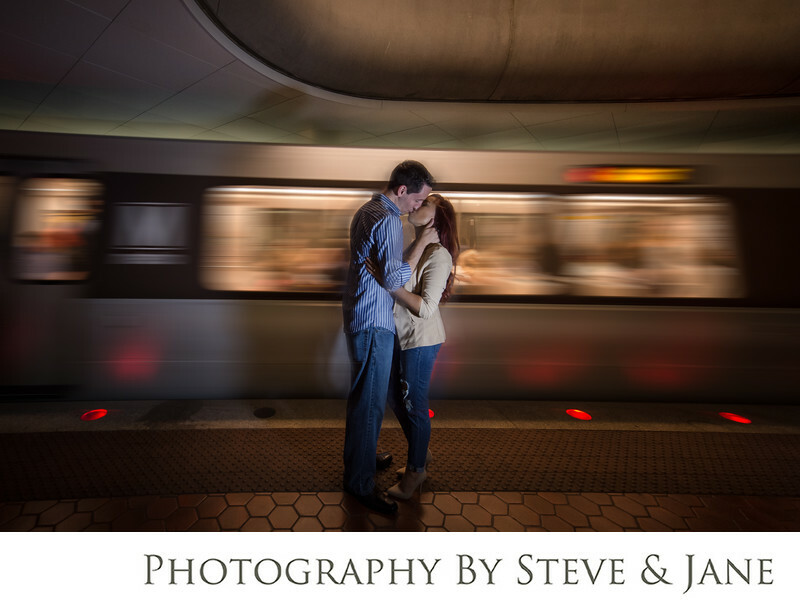 This couple came to DC where we captured a unique engagement portrait session in the Metro station at Dupont Circle. A lot of couples choose the monuments or a backdrop that screams DC when choosing a location for their engagement portraits. DC also offers a lot of different settings that can set your photos apart from the crowd. At first glance, the dim setting of the metro station at Dupont circle doesn't seem like a great place to take portraits. if your photographer is well trained in creating light, it's the perfect place. Adding in a simple video light or a flash with the proper modifier can take a blah photo to exceptional. Add in the motion of the metro, with it's cars full of commuters, and you have a setting rarely seen in engagement portrait photography. This couple had no reservations about displaying some affection in the busy metro station. Good emotion makes a big difference in your engagement and wedding portraits. Relaxing and forgetting you are in front of the camera is the best way to go. Engagement sessions help you understand how your photographer works on the wedding day and gives you a chance to have your portraits taken in a more informal setting. You'll feel comfortable in front of the camera and know how to pose and interact with each other for the best results possible.